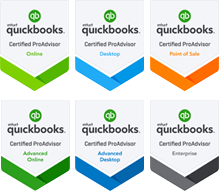 Our team of experienced QuickBooks and accounting professionals can create a business support plan customized specifically to your company needs. Whether you are starting a new business, or trying to manage change in an established business, we can help provide peace of mind through precise financial and accounting services. Our list of credentials within our staff and close advisory circle includes several CPA, CFE, and Certified QuickBooks ProAdvisors who can provide onsite and/or remote accounting support. Our mission is to give our clients greater control of their businesses through accurate, timely and consistent financial reports. We help maximize the utilization of QuickBooks and related third-party software tools and processes to fully customize a business solution touching every aspect of fiscal management. Our clients are empowered to focus on more profitable services, drive new business and reduce recurring costs.